Dragon Pearl Junk has stood on top recommendation list of Halong Bay Cruise ever since it started operation. Despite its modest design and standard amenities, it is the staff's attention to details and unique cruise program that have earned its reputation. Dragon Pearl crews always try to make you feel comfortable on board and ensure that you enjoy the trip to the fullest. As for the program, you will be cruising mainly in Bai Tu Long area, where you can see more of Halong and less of tourists. 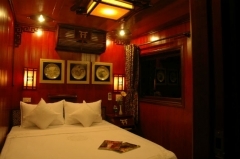 There are a total of 3 vessels named Dragon Pearl Junk, each with 11 well appointed cabins, with fine woodwork cutting through the architecture and interior decoration. The common area can seat up to 36 and perfect for any cruiser looking forward to venturing out Halong Bay. The sundeck on top of the cruise is great for phototaking, sunset watching or simply resting. Enjoy the colors and images of the Bay with Dragon Pearl and you will not be disappointed in the least. Our guide picks you up at your hotel in Hanoi at 8:00 and travel to Ha Long on our bus ( transfer not included in cabin price). The trip is long but enjoyable with beautiful sceneries of Vietnam’s nature: romantic rivers, grandiose mountains, lush green paddy fields, etc. Arrive at Hon Gai Harbor by noon. After checking-in and enjoy welcoming drink on board is the lunch time with delicious freash seafood menu. The junk starts cruising around the magnificent Bai Tu Long Bay where you might admire unique formations of islets of the Bay. Continue the cruise by visiting the primitive cave of Thien Son. Move to Hon Co Island where you may relax on a white sandy beach or swim or kayak before returning to the junk in late afternoon. Anchor at a peaceful area on the Bay for dinner and overnight on boat. Enjoy the sunrise in the early morning while enjoying a cup of hot coffee/tea and light breakfast on boat. Transfer to small rowing boat and kayak to Vung Vieng Fishing village to meet the local people and pass through the floating school and fish farms. Come back to the Dragon Pearl Junk, pack up your luggage and enjoy the farewell lunch on-board while the ship is moving back to Hon Gai Harbor. Disembark at the harbor at 12:00 for a car trip back to Hanoi. Can you cater for specific dietary needs? We are vegan (do not eat meat, seafood, dairy or eggs). Hello I want to book a cruise for 2 adults. 2 days 1 night. On august 9. on August 10 I have a flight to Cambodia at 6:05 pm. My question: Is it possible to reach the airport in time? Dear Mr. Joel Delgado, Thank you for your question. If you book a private car, you can go straight to the airport and be ontime for your flight. For shuttle bus it only returns to Hanoi at 5:00pm so there will not be enough time. If you have any other questions please let me know. Is Dragon Pearl junk better than Indochina Sails? Do they belong to the same company? Dear Johnson, Thank you for your question and Dragon Pearl and Indochina Sails are two separate cruise operators. Dragon Pearl Junk belongs to the Indochina Junk group and Indochina Sails operate vessel of the same name and Valentine Junk. It is hard to tell which one is better as each offers their unique program with unique features. You can contact us: info@halongbaytours.com should you need a more detailed comparison between the two to help you decide! Is the cave dinner included for 2 day 1 night trip of this cruise? Dear Gini, Thanks for contacting us. Dragon Pearl Junk currently offers dinner in cave for its 3 day 2 night trip only. If you are interested in dinner in cave for 2days 1night, you can look into La Fairy Sails Cruise or email us info@halongbaytours.com then we could get back to you with more information. Thank you for your understanding! Everything is quite good, nothing to complain. Very well-organized tour! We enjoyed beach trip and fishing village exploration. My son really liked kayaking and swimming. BBQ dinner in cave was amazing. Meals on boat were super excellent, we always felt full. Dinner in cave was outstanding. Great tours to fishing villages & beach cave. However, the cruise should give more instruction for kayaking. Although the cruise shows its age and needs some refurbishments, I still don’t hesitate to recommend it to my family and friends. I stayed in a small but comfortable cabin. Sheets were clean & fresh, A/C worked well. Staff was extremely accommodating and informative. Lovely food with lots of fresh seafood. the itinerary was rushed for 2 days, so we didn’t have enough time to enjoy picturesque views of Halong Bay and Bai Tu Long Bay. Nothing prevents me to give this cruise 5 star. Cabin, crew, food, activities, all were excellent. Thank you so much for taking care of me. I really liked the vegetarian food the chef meticulously prepared for me. It was so yummy and lots of choice.